This week in a special Outside the Box my good friends at Stratfor addresses the current Chinese dilemma created by their One Child Policy, namely how to continue economic growth with a rapidly aging population coupled with a deteriorating labor force, mind you striving to attend to these issues simultaneously without creating significant rural unrest. Stratfor predicts a less than somber outcome, anticipating Beijing' inability to address these dire concerns simultaneously, with the result being bureaucratic malaise and rural unrest. Stratfor, run by geo-political maven George Friedman, provides some insightful and comprehensive research on geopolitical events and global affairs, and is my favorite source for keeping up with what is happening in the world, and what the events actually mean. He continues to be generous by offering my readers a discount to his normal subscription rates which can be obtained by clicking here . China's one-child policy has reached a crossroads after two decades of stricter implementation in urban areas. As a result of these different levels of enforcement, urban governments now face a starker demographic reality than their less prosperous rural counterparts, while the one-child policy has become a key catalyst of rural unrest as a symbol of rural-urban inequity. Beijing probably will loosen the policy for urban areas where labor shortages are most acute, simultaneously trying to redirect rural anger toward local government corruption. Ultimately, Beijing probably cannot achieve both, with rural riots the likely result of trying. China's controversial one-child policy has been an integral linchpin in China's economic successes and ability to lift 412 million-plus people out of poverty in the last quarter-decade. Nothing epitomizes the success of China's one-child policy better than the 1991 decision by the U.N. Population Fund to export China's population-growth control and family planning techniques to countries such as Peru and Vietnam. Twenty-six years on, the one-child policy has reached a crossroads. This has resulted from two decades of disproportionately stricter implementation in urban areas, which now face a much starker demographic reality than their less prosperous rural counterparts. The one-child policy also has become a key catalyst of rural unrest. Though pragmatically justified, formally exempting rich urbanites from this intrusive policy could ignite riots across rural China. Beijing most likely will try to direct this frustration toward local governments, hence diverting any political backlash from the Communist leadership. Introduced in 1979 to combat the problem of feeding its enormous population, China's one-child policy always has been more relaxed in rural regions, where local governments were not required to provide social services for their citizens. Though urban citizens only could have one child, rural farmers were often allowed a second child under a variety of circumstances (e.g., if the firstborn was female). Implementation of this rule was delegated to the local level, providing adaptability for the extremely intrusive policy. When introduced, public resistance was low, mainly because of widespread public acceptance that something had to be done if poverty levels were to be lowered. This policy has several key consequences, including a higher male-to-female ratio. Key consequences also include a decline in the natural growth rate of China's population. A marked rise in the average age of China's workforce also has resulted. Finally, the elderly form a larger proportion of urban populations since the one-child policy has been stricter in towns and cities. Thus, the supply of future young workers is falling faster in towns than in farming villages. More relaxed application of the policy in rural areas led to a disproportionate underreporting of new rural births, whereas stricter urban monitoring has led to disproportionately older urban demographic profiles and faster aging urban workforces. An inadequate supply of manual workers to fill available positions has led to emerging signs of wage inflation in eastern and southern coastal cities, where much of the country's manufacturing export hubs are based. In contrast, unemployment is high and jobs scarce in rural areas with relatively higher birth rates. 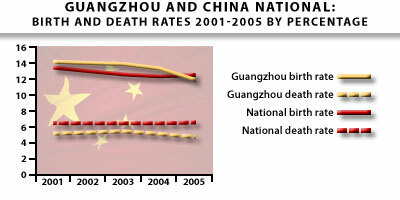 Beijing acknowledged in 2002 that China's population had been largely brought under control when the Population and Family Planning Law came into effect, loosening restrictions. China's family planning policy is no longer a tool of population control, but a tool of domestic development aimed at directing jobs to rural regions where unemployment and outward flowing rural-to-urban migration are highest. Although rural-to-urban migrant labor inflows continue, they have not been enough to satisfy the labor shortages that coastal provinces (like Guangzhou and Jiangsu) have experienced in the last two years. Wages for manual labor have started creeping up for foreign investors concentrated in these export hubs, opening up the possibility that such investors will relocate to neighboring countries such as Vietnam, where the price of manual labor is becoming increasingly competitive with the price in China. If China is to prevent the current labor shortages from becoming a long-term phenomenon, it needs to refine its family planning policy and not rely on unpredictable -- and socially destabilizing -- outflows of migrant labor. To do this, Beijing needs to generate more jobs in, or attract more jobs to, rural areas. It also needs to achieve higher urban birth rates to provide workers for urban employers. Unfortunately, the tinkering required to boost urban birth rates will involve a loosening of one-child policy rules for urban -- but not rural -- areas. Historically, rural unrest over the one-child policy is linked to corrupt government officials who have abused the policy to collect fines and confiscate property. Beijing had to send in police and military units in May to quell riots in Guangxi province sparked by nighttime raids on women allegedly pregnant in violation of the policy, whose property was to be confiscated as penalty. The angry locals had attacked police stations. But if there is one thing that stokes rural discontent more than government corruption, it is the rural-urban wealth gap and associated inequalities. There is a widespread rural perception that, not only have rich urbanites gained most from China's economic miracle, they also are using their newfound riches to buy their way out of laws and regulations that the rural masses must endure. An example of what could trigger such rural accusations is the July 4 decision by the government of China's southern city of Guangzhou to further relax the one-child policy for its urban citizens to tackle economic and social problems associated with the city's rapidly aging population. Nearly 13 percent of the city's population is currently more than 60 years old. By 2010, it is estimated the city will have more than 1 million people over 60, but will be able to accommodate only 40 percent of them. The most promising solution to this dilemma is to find ways of boosting the fertility rate of the nation as a whole by encouraging women to have more children. And while the surplus of manual labor jobs in the east and southern coastal regions justify relaxation of the one-child policy in order to boost the local working age population, the lack of jobs in less developed rural regions means that, until jobs are transferred in from the coast, Beijing is in no rush to boost rural birth and hence rural unemployment numbers. In China, the rural unemployed do not stay at home -- the majority most often migrate away from their registered rural homesteads to join China's 150 million-plus population of floating migrant workers. Though these workers do help to alleviate the labor shortage in coastal cities, Beijing sees their unmonitored movements as a destabilizing social force; and in any event, the rural supply of excess workers has also started to dry up. These rural migrant workers already overcrowd cities, straining limited city budgets. As long as there are not enough jobs in rural areas, Beijing has no desire to increase the rural population simply for them to flow toward urban areas in search of work. Tracking down and monitoring the size and directional flows of this floating population is one of Beijing's biggest concerns. The central government has tried for some time to make monitoring migrant workers already living in urban areas a local government responsibility, but has had only limited success. Rather than boost the rural-urban inflows of migrant workers to cater for excess labor demand, Beijing would prefer to move such jobs inland, from where the migrant inflows originated. Beijing plans to turn this into a problem of local government corruption, as opposed to a generic problem about the one-child policy itself. To do this, the central government will merge local government abuse of the one-child policy into its ongoing anti-corruption campaign that started in September 2006 in Shanghai, just as it has with other issues that have been stirring up public unrest, like the pollution of drinking water. To this end, the central Chinese province of Hunan, which is largely rural, explicitly linked violation of the one-child policy to Beijing's anti-corruption crackdown against local government officials. Hunan officials said July 8 that almost 2,000 officials had been exposed for breaching the one-child policy. Ultimately, this attempt to defuse rural anger over the one-child policy while minimizing the rural-urban inequity gap probably will not work. For the rural-urban demographic variation to be rebalanced, selective implementation of family planning policies, such as further loosening rules for urban areas relative to rural regions, is inevitable. But Beijing can boost its chances of success by making sure urban governments relax their one-child policy more quietly in the future. The Internet and local press will undermine these efforts, however, meaning villagers more than likely will catch wind of any such disparity. Until the problem of local government corruption causing abuse of the one-child policy is rooted out, and the rural-urban wealth gap significantly reduced, rural unrest in China will only continue to escalate -- which explains the urgency with which President Hu Jintao is addressing this issue. The biggest challenge is not what is described in "China: The One-Child Policy Dilemma", but why we firmly believe that we can grow forever, not only in number of people, but in growing structures in a finite space like Earth. This created an environmental disaster, which consequences can be the end of our civilization. There is no single example of economic development without ruining Nature, for instance, US and Europe destroyed almost 100% of its natural forests and the examples are everywhere. Global warming and global extinction were possible because of global trade, otherwise, very devastated developed nations and fast growing and populated nations would already have reached their own environmental collapse. Instead of that, they are exporting nature devastation to the rest of the world through global trade, where ecological costs are considered null by our value system and by false economic theories, that bravely assumes by old assumptions that nature is inexhaustible and that economic system is environmentally neutral. Global warming and global extinction are not the only threats. Growing demand for finite water and soil is the challenges that economies are facing and, contrary to using non-renewable natural resources that are in fact endless, these two resources will create a very weird situation and wars in near future. Until now, we only explored 1% of Earth crust, non-renewable are in fact endless and the prices never included nature devastations and ecological costs. The problem is not in the planet as a supplier, the problem in the planet as an absorber of the impact of what we are doing. And, the problem in not with the planet. The problem is with us. It is not the nature that is being destroyed. It is us. Nature and planet are untouchable, human beings are nothing for the billions of years of this planet existence. Growth as social salvation is a myth. Eternal growth in a finite world is a huge mistake. Accordingly to Charles Darwin nothing differentiates human beings from other animals, we are totally nature dependent, and this has been told for so many decades that is absolutely incredible that nothing was done to refrain both population and material economic growth. Now we will have to face the consequences. Is that possible that until the end we are going to repeat the same advices? Growth, growth and growth?